Not only is this one of the largest dinosaur collections, it’s also one of the best. These dinos are the real deal — of the 19 skeletons on display, 15 contain at least some real fossil material. Frankly, it was a challenge to get the kids to actually look up at the skeletons, so focused were they on the video kiosks. They clicked and swiped, looking through the info about where and when each species lived, their lifestyle habits, which species were related, etc. Look! It's an actual...real...dino...oh never mind. If you were there that day, and you heard an exasperated mom pleading with her kids, “Look! It’s a Triceratops! Look at its horns! Did you know it was a plant eater? Hello? Where did you go?” That was me. 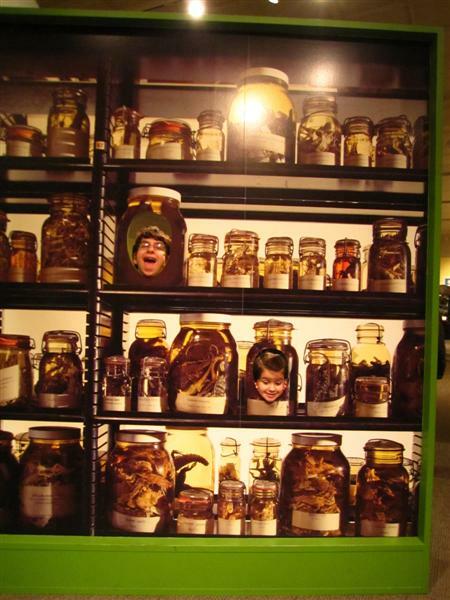 But while the dinosaur collection is really impressive, it wasn’t the highlight of The Girl’s day. She could not get enough of the temporary “M is for Museum” exhibit on the third floor. GO SEE IT before it leaves on August 30, 2012! This expansive space dedicates themed stations for each letter of the alphabet. (e.g. A is for Artifact, D is for Draw, X is for X Marks the Spot). 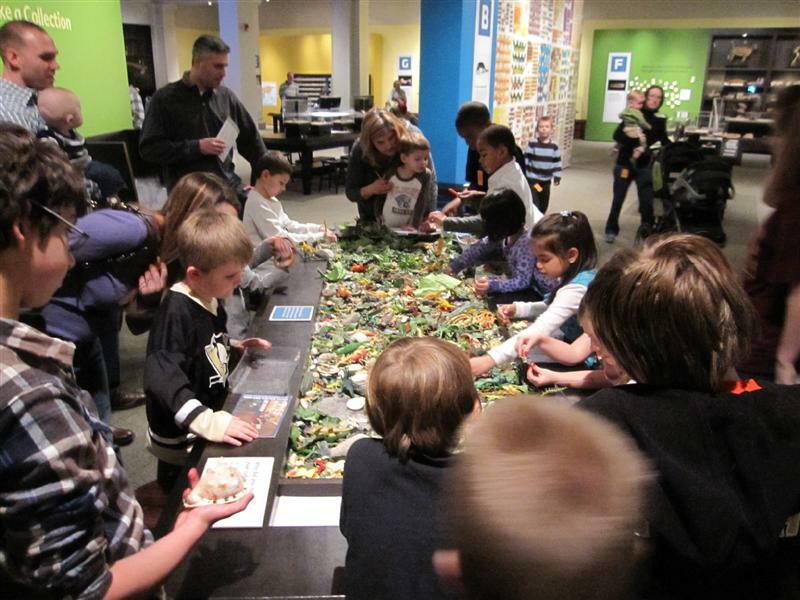 At the “C is for Collection” table, kids are encouraged to fill a basket with their own collection from a well overflowing with small plastic dinos, butterflies, bugs, leaves, and more. After you go through the stations, you proceed to Z is the Zone, an arts and crafts area with books and puzzles. The other fun area is on the first floor. The Bonehunters Quarry is a big archaeological dig site. 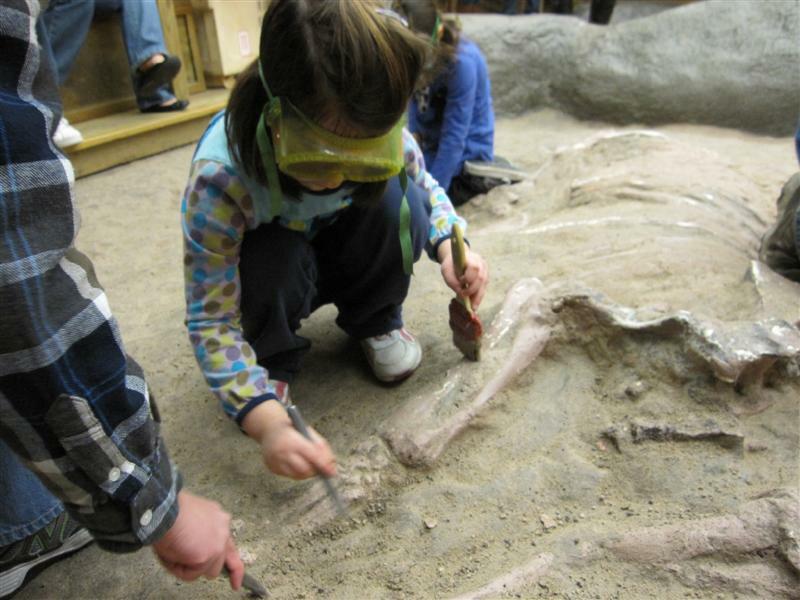 Kids get goggles, a pick tool and a brush, then get to go unearth bones. Rockin’ the protective eye gear. Outside this exhibit is the “Collection Connection” with racks filled with more than 50 tack boxes. Each box is dedicated to a specific animal, identified by its picture. The Girl chose the skunk box, inside which was a real animal pelt, jaw bone, tooth, photos and books. I dared The Boy to open the bat box. Two shadow boxes contained real, taxidermied specimens. He slammed the lid shut and shuddered. My dreams for a physician in the family now lay on my daughter’s shoulders. As a whole, this museum really rates high in my book. 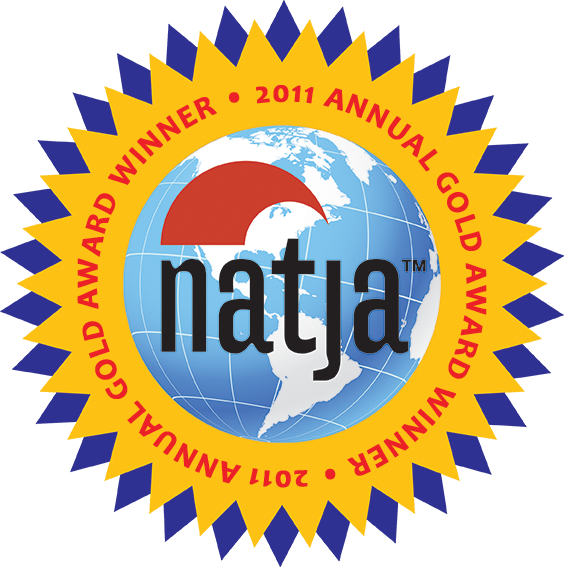 This place has mastered the magic formula which combines education and entertainment for kids (of all ages). What lovely specimens. This may be our Christmas card photo this year. Disclaimer: We received complimentary admission to this facility, courtesy of Visit Pittsburgh. Wow? This in Pittsbugh? That place looks great. Another for my list I guess…Great post. Impressing exhibition. Very informative not only for children but also for adults. I love, love, love dinosaurs. 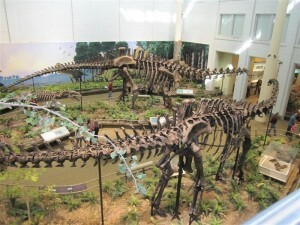 Recently learned that most dinosaur skeletons are just replicas. That is cool that 15 out of the 19 dinosaurs have real fossil material. Love the post! Very nice. 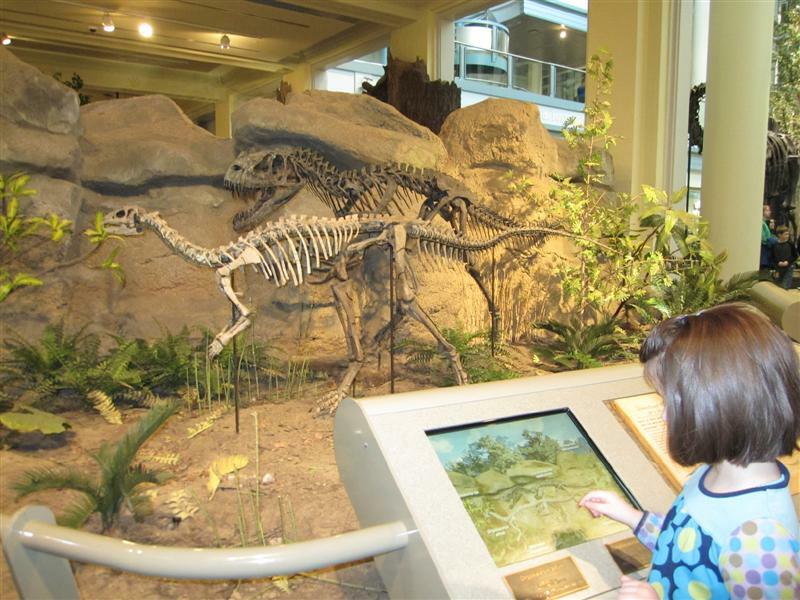 I have always loved museums with very hand-on exhibits in which kids can also enjoy the first hand experience. Hi there, I found your web site by the use of Google while searching for a related topic, your site came up, it looks great. I have bookmarked to my favourites|added to bookmarks.